ONGEA! Summit will take place on Thursday 28th to Sunday 31st January 2016, at Sarit Centre Expo Hall in Westlands, Nairobi. This will also serve as an unveiling of the new brand. 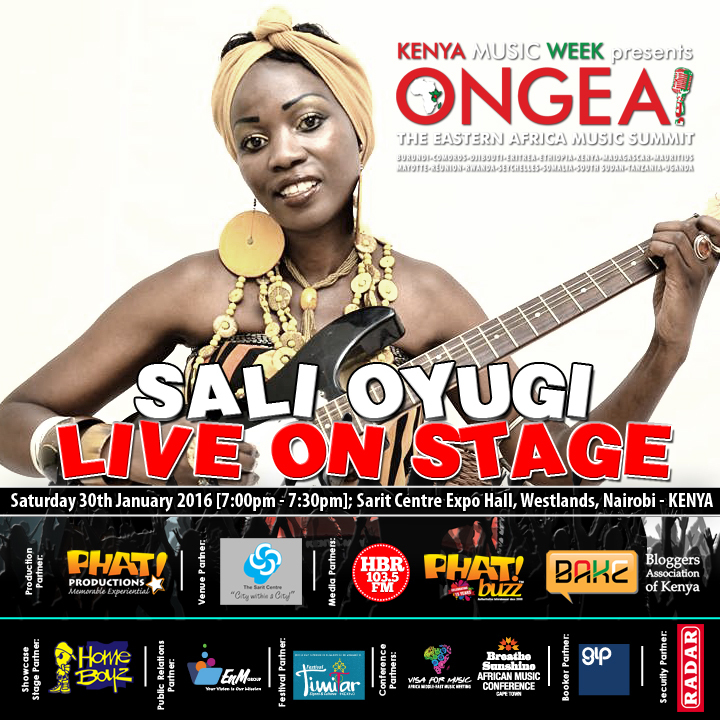 The Kenya Music Week has re-branded to ONGEA! – The Eastern Africa Music Summit, in a move to bolster the Music Industry and widen the Forum’s profile Regionally and Globally. The Summit is organized by PHAT! Music & Entertainment Limited. The move to Re-brand from KENYA MUSIC WEEK to ONGEA! is based on the need to ensure increased sustainability and relevance of this industry, by opening it up to a larger market. Showcase- through 30 minute live performances by upcoming and professional artists from 6.00 pm to 10.00 pm. The activities lined up for these three days are engaging for any stakeholder in the music industry. There will be 32 performances over the 4 days from artistes such as Makadem, HART the band, ADAWNAGE, Kidum, Wyre, Sally Oyugi, Suzan Kerunen, Ms. Okinda, Parking Lot Grass and Cannibal among others. The Sauti Academy will conduct auditions with two scholarships up for grabs. There will be a studio where you can record a free demo of your music courtesy of Ageless Entertainment. The demos will be showcased to attendants at the summit. Mobile Apps for the music industry will also be unveiled one of which is MzikiTrak. Bloggers Association of Kenya will hold a Blogging and Social Media Training at this year’s ONGEA! Music summit from 9 am to 12 pm on Friday 29th January. The training will be at the showcase area of Sarit Centre Expo Hall. Topics to be tackled during the training include: personal online branding and management, writing skills and readership, understanding Copyright and fair use, Social Media ethics, among others. The training will also touch on copyright in regard to content ownership, originality and authenticity. Participants will also be trained about the use of social media to market their brand. Participants interested in the training can register here by 22nd January, 2016. Entry to the whole summit is free. Separator image Posted in Dada's Hangouts and tagged with KENYA MUSIC WEEK, MCSK, ONGEA!, Partnerships, The Eastern Africa Music Summit.